The resurfacing of the playground has been in the pipeline for a long time as it is a considerable investment of Parish funds. We have been concerned to make the right choice which will last the distance and, above all, be safe for our children. The current surface, while suitably soft, unfortunately attracts weeds but the new rubberised surface should be maintenance free. We will let you know when this project has been completed. On Saturday 16th February your Parish Council (plus partners and friends) assembled at the Village Playground to add some extra strengthening to the climbing equipment in preparation for the long-awaited resurfacing planned for the next few weeks. The structure, thankfully, was still pretty solid but the Parish Council felt it was advisable to add extra stanchions to the supports to make absolutely sure no rot had, or could, set in before the permanent rubber surface is added. Thanks to all who turned out and especially Rob and David! This weekend saw three great events in the village. Saturday morning kicked off with the Big Breakfast and Bazaar at the village hall. Many of us enjoyed a cooked breakfast, browsing the stalls and having a chat with their neighbours. Over £500 was raised for good causes. The village hall then hosted on Saturday evening the Barn Dance. Renowned caller Jeremy Child made sure everyone got on the dance floor and joined in with Chris Jewell’s live music. There was much fun and hilarity while everyone – from young and old – tried to master the steps. Finally, The Lamb hosted another local’s evening on Sunday. This festive get together also saw a very good turnout, with the village website being shown to those who hadn’t seen it yet and some good discussions about future village events. We would like to thank everyone for their support and attendance at all these events in the village this weekend – and would like to wish everyone a very Happy Christmas. 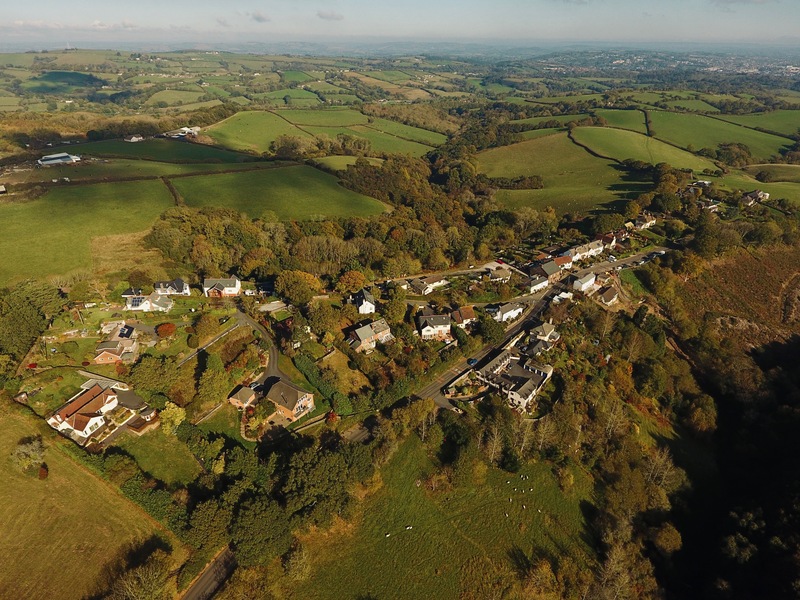 There have been some amazing clear skies over the last few months and we took the opportunity to take some aerial pictures of Longdown. This one was taken on the 29th Oct 2018 from the southern end of the village looking towards Exeter. Can you see your house? If you have taken any interesting pictures of Longdown and Holcombe Burnell then let us know. It would be great to share them.